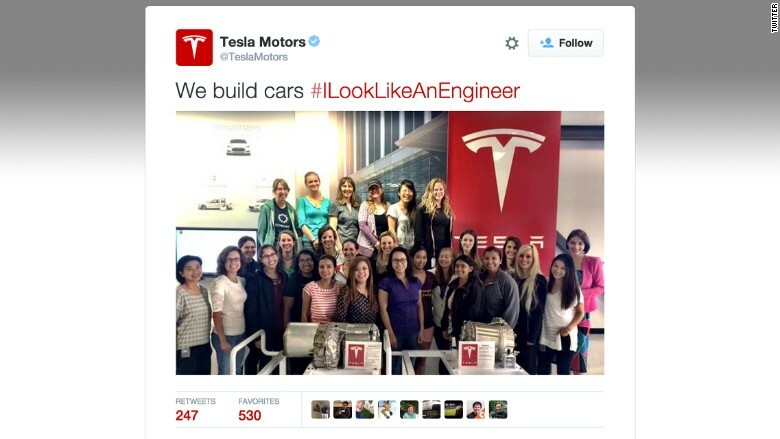 A group of Tesla workers adopt #ILookLikeAnEngineer. Twenty-seven female engineers at Tesla are the latest to own the hashtag #ILookLikeAnEngineer. The electric car maker tweeted a photo Wednesday morning of the women posing in front of the Tesla logo with the text "We build cars #ILookLikeAnEngineer." It's a rare glimpse of Tesla workers. CEO and co-founder Elon Musk is the face of the company, and its inner-workings are usually kept out of the public's sight. The Palo Alto, California-based company has about 10,000 employees. 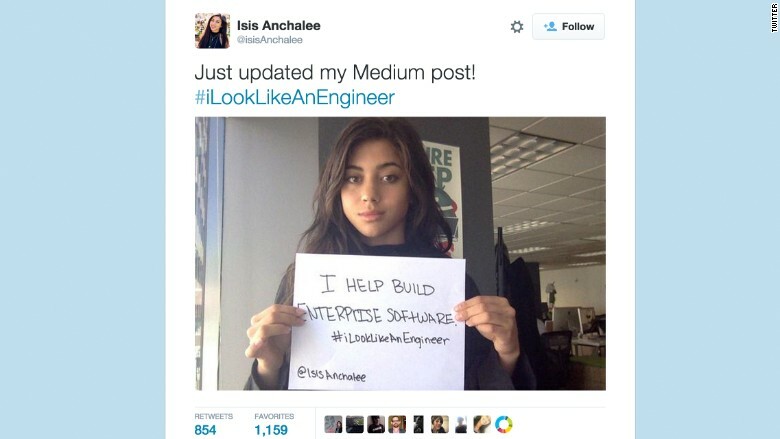 The stereotype-bashing hashtag #ILookLikeAnEngineer" has been buzzing around social media since it was coined by Isis Wenger, a 22-year-old engineer at the tech firm OneLogin. Wenger appeared in an ad campaign for OneLogin, but she kept hearing that she didn't fit the mold of what an engineer should look like. So she tweeted a picture of herself with the hashtag, which quickly began trending. It's also going on a billboard in Silicon Valley. "The negative opinions about this ad that strangers feel so compelled to share illustrate solid examples of the sexism that plagues tech," she wrote in a Medium post published on August 1. "I'm sure that every other women and non-male identifying person in this field has a long list of mild to extreme personal offenses that they've just had to tolerate." Wenger's catchphrase has been tweeted more than 101,000 times in last 30 days. Engineers at other companies including Snapchat, The White House Office of Science and Technology, MIT and NASA have also adopted the hashtag.